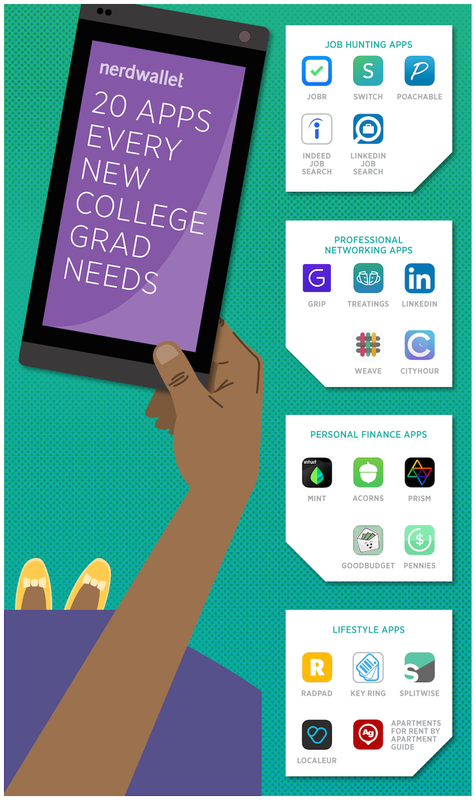 After college graduation, something as simple as a mobile app can make your future easier to navigate. We’ve compiled a list of 20 great apps that can help you do it all: search for a job, network with pros, create a budget, invest, find an apartment, split bills with roommates and more. Jobr, nicknamed “Tinder for jobs,” lets you swipe right or left to apply for — or reject — job opportunities. Login with Facebook and then import your resume using Google Drive or Dropbox. To weed through job postings, filter according to minimum salary requirements, industry (also called “tracks”) or location. If a hiring manager is interested, you’ll be introduced via the in-app chat feature. The app records your matches so you can keep track as you swipe. Switch is another swiping app that matches you to available jobs. It imports your information from your LinkedIn profile and filters results according to your previous experience, salary requirements and location. It’s also anonymous and private, which means you’re matched only according to your credentials. When you find a job you like, and the recruiter thinks you’d be a good fit, the app allows you to chat. Repeated use helps Switch’s algorithms to match you with prospective jobs that better fit your skills and interests. Employers already on your resume won’t be able to see your profile. LinkedIn Job Search helps you find positions using your LinkedIn profile. You can search, sort and filter according to location, company, job posting date and relevance, and the app sends suggestions based on the jobs you view. Clicking on an open position lets you learn more about the job poster and your connections at the company. Then you can apply directly through the app. Not ready to apply? You can track positions you’re interested in and set up notifications to find out when new jobs open up. The app is private, so your LinkedIn network won’t learn about your activity. Anthology is for those who are already working, but looking for a change. Through the app, you provide your resume information and criteria for a new position, including its salary requirements, location, seniority, skills, benefits or title. The app’s algorithms compile positions that might fit, and if you want to know more about one, Anthology contacts the employer and reveals some of your information, including your current and previous jobs. Your identity remains private until both parties agree to connect. You’ll never be matched to your current employer. Indeed’s Job Search app offers access to millions of positions worldwide. You can search by job title, company, location, job type and more. You can also read company reviews to find out how employers stack up. Use your Indeed Resume to apply in-app, and follow your favorite companies to find out about new openings. Weave is a swiping app for professionals that bills itself as “LinkedIn meets Tinder (minus the dating).” Sign in using your LinkedIn account, and browse other professionals according to city, neighborhood, title and industry. You can chat with people who’ve also expressed an interest in meeting you, or check out the app’s “rooms” for different networking needs, such as hiring or fundraising. Weave even integrates with Uber to pick you up for meetings arranged through the app. Treatings is a networking app that connects you to like-minded professionals. Use your LinkedIn account to sign in, then add interests and favorite meeting spots to your profile. You’ll be matched with others nearby who have the same interests. Once you’ve matched, you can chat in-app. LinkedIn is the first name in professional networking, so its app is a must-have to keep track of your post-grad contacts. With it, you can edit your profile, stay on top of your connections, send requests, share updates, search and build your network. If you’re looking to expand your professional network online, but still want to meet people face-to-face, CityHour is the app for you. Sync up the app with your LinkedIn profile to search for nearby contacts in and outside of your network based on industry, professional goals, location and more. To communicate with your new contacts, CityHour provides in-app chatting as well as a “Let’s Meet Now!” feature that helps you find people within a 50-mile radius who would like to meet up within the next two hours. Grip helps you find professional connections with mutual interests. First, login with LinkedIn to import your resume. Then join communities that interest you and use the swiping feature to make connections. You’ll acquire “handshakes” when someone you want to meet also wants to meet you; then you can chat through the app. Mint is a web-based personal finance tool that helps you manage your money by making all of your accounts — including your bank account, credit cards, student loans and more — viewable in one place. Through Mint, you can set up savings goals and budgets, create bill reminders and receive customized financial tips. GoodBudget helps you allot money for things like groceries, transportation and dining out each month. Its “envelope budgeting” technique lets you track spending by category, rather than keeping tabs on an overwhelming, all-inclusive budget. You can track what you’re spending from each envelope and strategize your savings goals. Prism aims to help you stay on top of your bills and get out of debt. Add your billers and your payment information — including your bank account, or credit or debit card number — and set up notifications to track and pay bills. When you have spare change left over after making transactions, Acorns automatically invests it in a diversified portfolio. There are no minimums to start. Once you begin investing, the app costs $1 per month for accounts under $5,000 and 0.25% of the account balance per year for accounts of $5,000 or more. The app invests your money into low cost exchange-traded funds, or ETFs, and automatically rebalances your portfolio as needed. One catch: You must be at least 24 years of age to use it. Pennies makes it easy to stay on a budget. The app doesn’t sync with any accounts, so you must manually add information when you make purchases. Pennies then sends reminders of your daily targets to encourage you from spending too much. The app uses color to indicate the health of your spending — the screen is green when you’re free to spend from your budget and turns red when you’re getting low on funds. RadPad lists more than 600,000 apartments and homes available for rent. Each listing includes at least three photos and is searchable according to price, location, number of bedrooms and bathrooms, amenities and more. If you’re interested in a place, message landlords through the app. RadPad’s DriveTime feature tells you how long it would take to drive, take public transportation, ride your bike or walk from a listing to wherever you want to go. The app also enables rent pay using your credit or debit card to any landlord, even if he or she doesn’t use the app. Apartment Guide’s app features thousands of rentals, with filters that help you search by numbers of bedrooms and bathrooms, price and amenities. You can search using a text view of the listings or a map. Save your favorites to access later or share via social media and email. You can also call or email property holders directly from the app. Splitwise takes the stress out of sharing rent and other bills with your roommates. Through the app you can can view balances, track spending, set up email reminders for bills and even make payments through PayPal and Venmo. Localeur helps find the best places to eat, drink and play in major cities based exclusively on the knowledge of locals, making it useful whether you’re traveling or have moved to a new city. You can use it to save favorites, make lists of places to try and add recommendations of your own. Instead of packing your wallet or keychain full of plastic rewards cards, keep them all in one place with the Key Ring app. In addition to your scannable reward cards, the app includes weekly ads and coupons for major retailers. You can create and share shopping lists, and add photos to your list so you get the right item at the store. Sign up for NerdWallet Grad’s weekly newsletter to get career and money advice delivered right to your inbox.